Sabrina the Teenage Witch debuts in the New Riverdale as JUGHEAD gets a new creative team with issue #9. Fan-favorite writer Ryan North (Dinosaur Comics, Unbeatable Squirrel Girl) and artist Derek Charm unite this September for all-new adventures of everyone's favorite slacker. 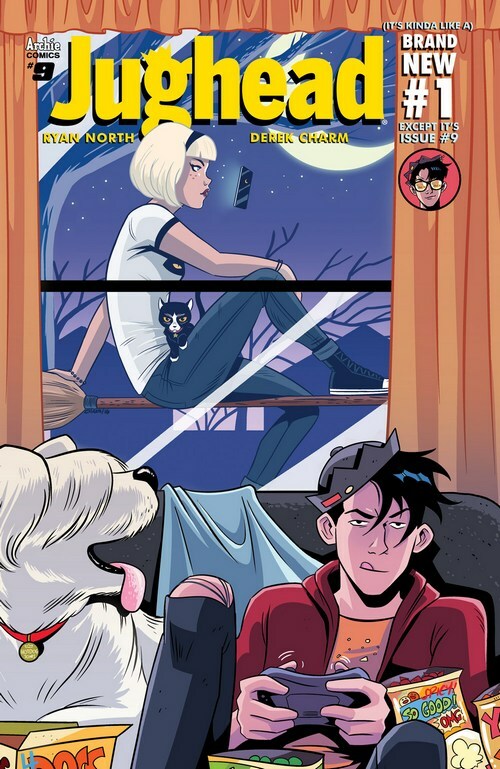 North and Charm will follow the hilarious and over-the-top groundwork laid by the JUGHEAD launch team of Chip Zdarsky and Erica Henderson as they introduce Sabrina the Teenage Witch into the New Riverdale for the first time! "Sabrina's interesting because she's literally magic. She is an actual witch in a world where witchcraft isn't known to be a real thing, and she's got this edge to her that you don't often see in Riverdale," said North on the addition of Sabrina to the series. JUGHEAD #9 will hit comic book shops on September 7th, 2016 featuring variant covers from Veronica Fish and Audrey Mok. And don't miss JUGHEAD #6 from Chip Zdarsky and Erica Henderson when it hits stores next week on 5/18 as Jughead faces Principal Stanger with the fate of Riverdale High on the line! (It’s kind of like a) BRAND NEW #1… except it’s issue Jughead #9! SABRINA makes her debut in the NEW RIVERDALE and things are about to get INSANE! New story! New arc! New creative team! Pop Tate's has a new mascot: it's a lady in a burger costume with a giant burger for a head! And she never takes off that giant burger head! And she and Jughead really hit it off, probably for that very reason! But is it possible Burger Lady is MORE than she appears? Find out what happens when Jughead meets a burger he REALLY likes—and a POWERFUL and unexpected new force in Riverdale is revealed!! P.S. : that powerful and unexpected new force is SABRINA THE TEENAGE WITCH! SHE'S the Burger Lady!